The ASA holds two conferences per year (one in spring and one in fall). Students are encouraged to attend and present at the conferences. The meetings are known for their relaxed and friendly atmosphere, as well as their high level of scholarship, and ASA members are always eager to meet and talk with students. During the semiannual conferences, the thirteen Technical Committees also hold their own meetings. The Technical Committees (TCs) provide a “home base” for Society members and are responsible for arranging the various technical sessions and promoting development in their respective fields. Students should attend these TC meetings to become more familiar with the inner workings of the ASA. If you are interested in becoming an ASA member, or if you would like more information, visit the membership page on ASA’s main site. If you still have questions, you can email a Student Council member in your field of interest or contact Elaine Moran (asa@acousticalsociety.org). There are many ways for students to get involved with and benefit from ASA. Going to an ASA meeting is the best way for students to get involved! At meetings there are plenty of activities oriented toward students, and there are funding sources available to facilitate student attendance at meetings. To learn more about these activities and funding opportunities, check out the meeting page. 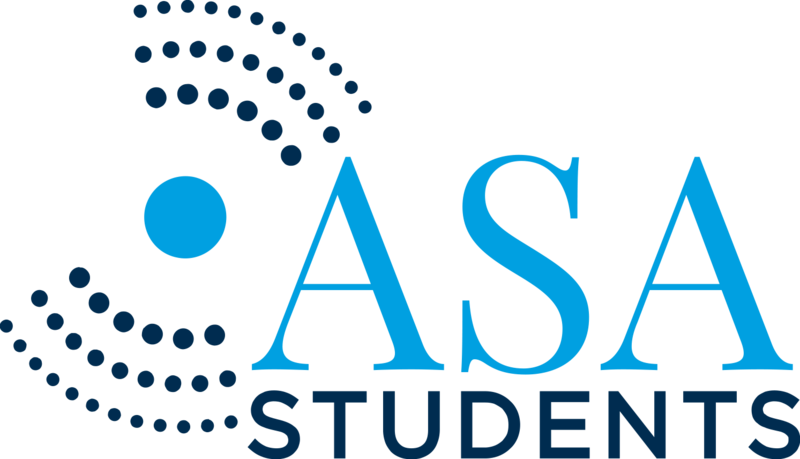 One great way to engage with the ASA during the meeting is to wear the ASA Student Member sticker included in your student registration packet. Although the sticker is optional, it helps facilitate networking between students and other members of the ASA. There are many ways to learn more about what the ASA offers to students both during and between meetings. Like us on Facebook or follow us on Twitter to connect with other students and receive periodic updates, announcements, and news. Check out the ASA website or the Explore Sound website to learn more about the ASA and its outreach efforts.